Reading through the whole forehand explanation is a daunting task. It can make it seem like NO ONE could ever learn to hit a proper forehand. In reality the forehand is not that complex. Many of the key points are duplicates. When it all is put together into one explanation, it quickly becomes apparent that there is not as much to a forehand as it seems. 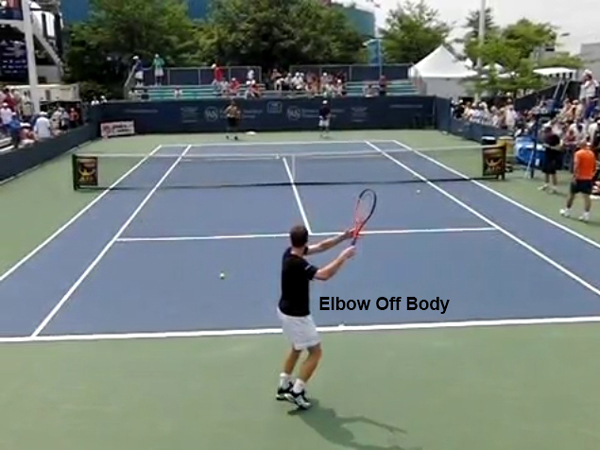 In this section the whole forehand will be combined into one section. Hopefully this will tie everything together and make it easier to understand the forehand. 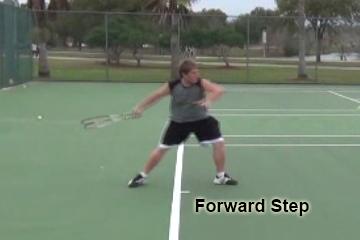 In this section the forehand will be compressed into 2 sections, the unit turn and the forehand swing. This is because the forehand is a two part swing. 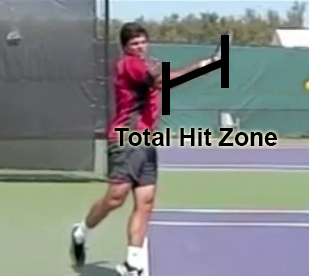 As soon as it is known that a forehand is going to be hit, the unit turn should be started. The main thing to focus on during the unit turn is to use the whole body to turn the racquet into its proper position. By using the whole body the racquet will be in sync with the whole body. If the racquet is swung back it will quickly get out of sync with the body. Keep the left hand on the racquet as the unit turn is started. This will help the whole body turn. As the unit turn is completed the left arm should move off to the right side and be relatively straight. At the end of the unit turn the racquet should be at about the same level it was at the start of the unit turn. The hitting elbow should remain high and away from the body. 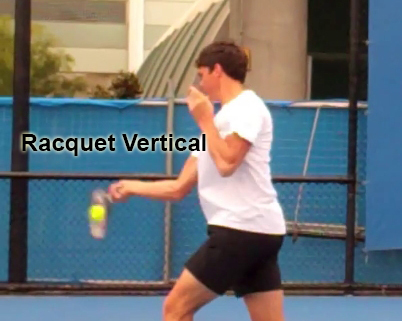 This will help to facilitate a vertical swing by making it virtually impossible for the racquet to go behind the back. As the unit turn nears completion the weight of the body should be almost entirely on the back foot. The forehand swing should be started at a really slow pace. To start the forehand swing, the hitting arm needs to be straightened out. Once the hitting arm is straightened out it will not need to be moved again until well after the ball has been hit. As the hitting arm is straightening out, the right foot should step forward to a neutral stance if there is enough time to step. After the arm is straightened out the racquet should be allowed to drop on its own. 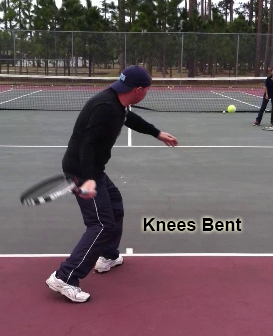 As the racquet is dropping the knees should be bent and the rest of the body should lower (including the non-hitting arm) as the knees and racquet lower. 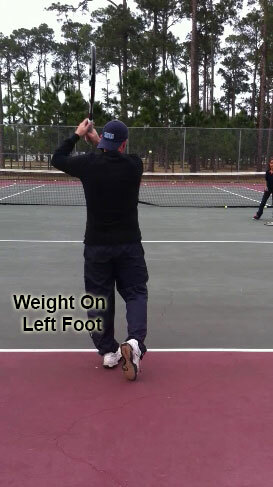 As this happens the weight from the back foot should start to transfer onto the front foot. Since the hitting arm does not need to be moved any more the racquet face should be slightly closed as the racquet drops. 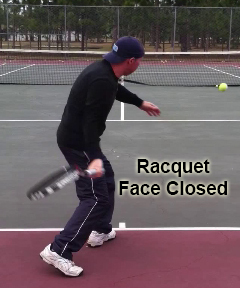 At the racquets lowest point the racquet should be close to the body and down by the back knee. The racquet needs to be at least 12 inches under where the ball is going to be hit to get topspin on the ball. 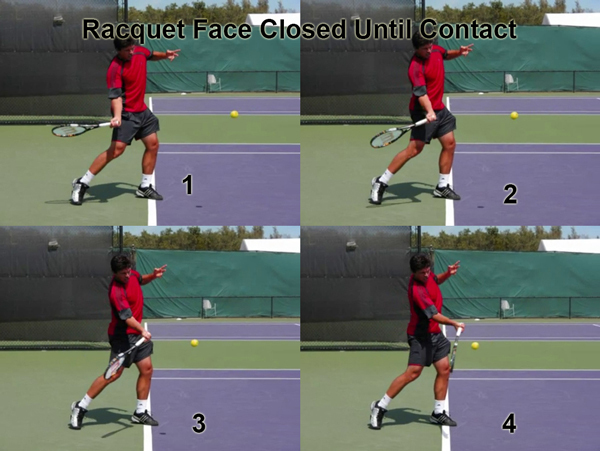 As the racquet comes forward, the racquet face moves from a semi-closed position to a vertical position at the contact point. 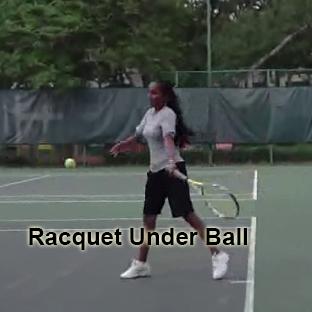 As the racquet moves forward the belly button will move from a position that is facing the side fence to a position that is pointing towards the net post. This signifies that the shoulders and hips are rotating forward as well. The knees will also start to unbend and the bodies weight will continue to transfer to the front foot. At contact the racquet needs to be completely vertical. After contact with the ball, the racquet needs to continue out towards the target for “three frames” this means the racquet face needs to be vertical for the three frames and needs to stay on a path that would allow the ball to be hit. Once the racquet has gone out three frames the arm can start to bend. 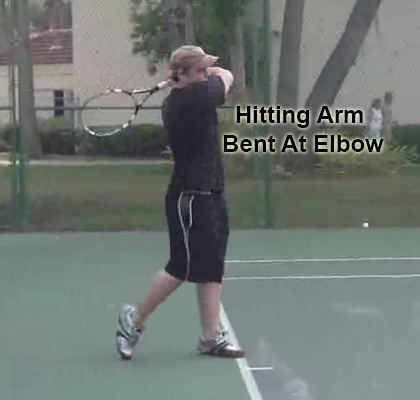 Its best just to relax the arm at the elbow and let the racquet continue up to the left (non-hitting) shoulder. After the swing the belly button should be pointing towards the net. This means the shoulders and hips are now parallel to the net. 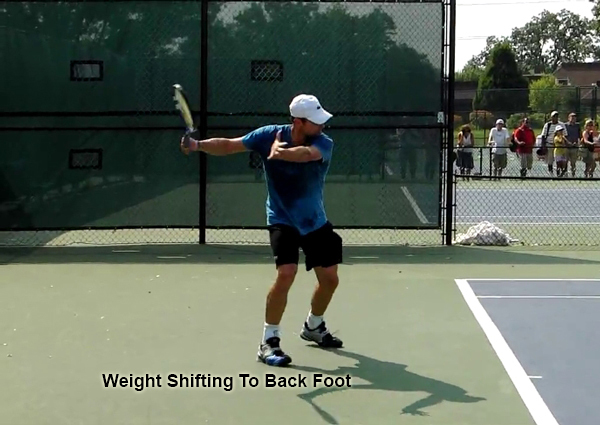 The racquet should be over the non-hitting shoulder and the bodies weight should have shifted to almost completely being on the left foot.